When Vlad told me about the opportunity of working with BonAppetour, I was happy. When he explained to me that it will be a gourmet dining experience with a local in Berlin I was really excited because I love food and meeting new people. Mostly because the food. Yeah, definitely the food. After part of the euphoria faded, the paranoia started to kick in and I thought: Where is this dinner taking place? What will the host be like? If I don’t like the host, but I love the food how will I enjoy the dinner? How will the food taste? If I hate the food should I still write about it? Pete is an English guy from Manchester. No wonder everybody was surprised when we heard about this, due to the fact that the we were in Berlin. A bit of a shocker was his age, and not to judge a book by his covers, but I think it is pretty hard to throw a gourmet dining experience in your mid twenties. However, as we later found out Peter have worked as a professional chef all over Europe: in the UK, France, Greece and for three years now in Germany. Pete is now part web developer and part chef at BonAppetour. He is a great host and he took into consideration our individual dining preferences. We talked about our trip, his background, about places to visit or eat in Berlin and even about PokemonGO (Vlad and I are both big fans 😉 ). The best part was that he explained some of his cooking techniques and told us about his blog where we found some of the recipes. The menu stated on the BonAppetour site is the following – for starters – strawberry, basil and balsamic bruschetta, for main course- slow cooked shoulder of lamb, seasonal vegetables, twice roasted potatoes and homemade gravy and for dessert- individual lime and ginger cheesecakes. However, some of us don’t eat lamb and Pete offered to cook something else: a barbecue. And it was even better! The first starter that we served was local bread and olive oil. After this, we had some homemade bruschetta with grilled bread and two types of tomatoes, garlic, Parma ham and olive oil. The bruschetta were really good and they gave a hint about Pete’s cooking abilities. The main course was Polish veil steak and, as Pete told us, the meat was personally selected from a local restaurant. I’d like to think that you can test someone’s ability to cook steaks by asking for different kind of cooking levels. In my opinion, it is hard to serve food with different cooking times all at once. The steaks were served with a honey dressed salad and a triple-cooked potatoes – crispy on the outside and mash-like in the middle. For sure this dish was one of the best that I have ever tried. There are no words to describe how good it was. The dish had the right ratio, taste and aspect to it, and you can almost see the passion and the experience behind it. I wish I left more space for the dessert. The homemade lime cheesecake was one of the best I had. I am a big fan of citrus fruit and my favorite desert is cheesecake so what can go wrong? But the texture (not too heavy) and the taste (not too sweet) of the dessert were a perfect combination. To drink we had the option of water, soft beverages like Coca Cola, red wine and a homemade Moscow mule, Pete’s favorite drink, a cocktail made with vodka, spicy ginger beer, and lime juice. Not only has Vlad tried two Moscow mules, but Pete teached him how to prepare it himself. Pete’s apartment is located in the Kreuzberg district, near the U Görlitzer Bahnhof and other public transportation stations. Although in the past the district was viewed as one of Berlin’s poorest, nowadays Kreuzberg is home to many bars, pubs and nightclubs and culture landmarks and is considered to be one of the cultural centers and visited part of Berlin. Besides many bars and pubs, in the district you can find Checkpoint Charlie and the Checkpoint Charlie museum, German Museum of Technology, Luisenstadt Canal, Landwehr Canal or many other landmarks. Would I recommend the gourmet dining experience offered by BonAppetour and Pete? Definitely yes. It is a great way to spend an evening with friends. First of all the food is great as it is cooked with passion. Secondly, Pete is a great host and wonderful chef, mainly because he is very careful with everybody’s dining preferences. Besides this experience, Pete and BonAppetour offer other experiences too – Market tour and 3 course meal with gourmet chef in Berlin. But you have to dedicate and entire day for this experience, so if you have limited time, it may not be the best option for you. 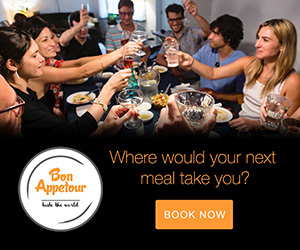 Are you ready for a unique dining experience with BonAppetour? Use the discount code EFFIT to get 10% off your next booking. Disclaimer: we were offered a complimentary meal by BonAppetour, but as always, all views, photos and appetite are entirely are own. The banner above contains an affiliate link. If you book through it, we receive a small fee, but it comes at no additional costs to you.